To design a 21st century school, you start at the end. You start by thinking about graduation day. You think about the kinds of students you want to send out into the world, about the world you hope to create with your school. At Stone, we our believe our students should reflect our mission. We want to graduate students who practice empathy, ethicality, and generosity; who are prepared for college; who are committed to making the world a better place. We want to graduate students who are critical and creative thinkers, who are sophisticated problem solvers, who are collaborative, who make connections between global and local issues, who believe great citizens are engaged citizens. By the time our students graduate we want them to be able to write at the college level and also understand how Physics explains the universe; we want them to visit another country, build a trebuchet, write a business plan and write code in Python; we want them to vote in a local election, pitch an idea to a Shark Tank, serve in student government, serve a local 501c3, and understand design thinking. We want them to express themselves through a challenging program designed to build authentic, real world intellectual sophistication." And it all begins with a better schedule. Stone's "module" schedule begins with the idea that everyone learns best when class time permits student-directed inquiry, deep exploration and experiential learning (see this New York Times article which looks at other schools with a Mod Schedule). Our schedule is also designed so that excursions into Lancaster, and community-engaged approaches to learning, can become a regular part of the school day. Our days are comprised of four 90 minute academic blocks -- those longer periods means better instruction, deeper learning, and a homework load that actually makes sense. Our full community comes together every day at 9:30 for "morning meeting" -- to go over a few announcements, to talk about issues facing our school or our world, or just to laugh (a lot!). The rest of our breaks -- including lunch -- are unscheduled periods which allow our students to collaborate, work, eat, or just....be. In the Mod System our schedules change every five weeks, which allows our students to take a variety of core courses and electives, and to develop an academic narrative that explains who they really are. And that block at the end of the year? That's an "intensive" -- a five day, forty-hour class designed to highlight what our students (and faculty) want most to learn. Sample intensives might include: a student-proposed trip to Bolivia; a week of focused studio art; music recording and production; "community" theatre, Trebuchet Construction, and much, much more. It takes 65% of our four year program to cover the "core" Pennsylvania State Graduation Requirements (four years of English, three years of Science, Math and History, two years of Foreign Language, and one year of PE). How do we use the rest of those minutes? 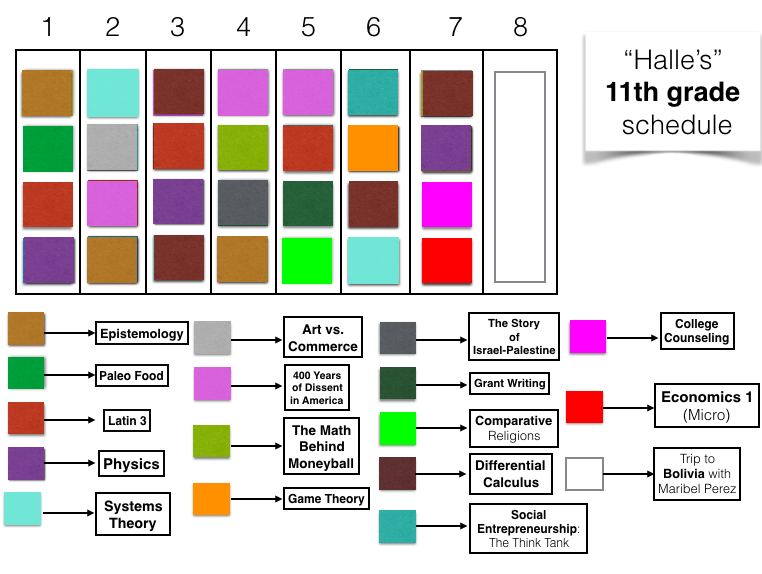 The Mod System doesn't just make better "days" -- it makes better academic careers. 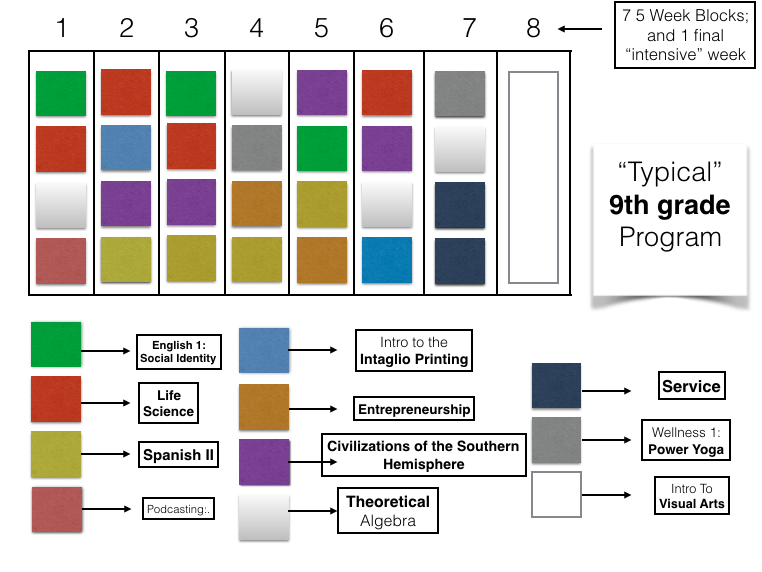 The Mod System allows our students to develop unique curricular through-lines which express who they truly are, what they are curious about, who they aspire to become. When our students are ready to apply to college, their applications show intellectual sophistication, real rigor, and a depth of academic experience that makes them stand out from "the pack". Like we said: when we designed our school, we began at the end. We wanted to graduate a cohort of students who care about the world and care about each other, who are prepared for college and prepared for the real world, who work hard, who love to learn, who laugh a lot, who think schools should be joyful places. And because we believe that better schedules make better schools, we built a schedule that makes it all happen. Want to see our schedule in action? Give us a call at 717-468-0019 or send us an email at info@stoneindependent.org and come on out to 43 North Lime Street!